This announcement serves as a secondary plunder leaderboard for Dungeon Keeper. Since technical problems with the in-game leaderboard have led to players and their scores not displaying when reaching the top spot, we're listing those illustrious few who have gone over the edge here. Congratulations are due to them for this major achievement! This will have to be manually updated, so it won't be concurrent with live data. If you have fallen over the edge, please PM DKDev_Chris with your player name and user ID. Thank Kat! This is awesome (and long overdue). Great for at least some recognition and motivation for these high-rollers - but - at the same time a digital monument reflecting the technical incompetence of the developer team at Mythic/EA. I am miss me at the plunderboard too. when do you fix this error? I think these three are the only new ones to go over. Ph4n7om; polish guild will be over soon. Fixing the plunderboard is not an insignificant effort, and will take some engineering work. It's on the top of the priority list, but does not currently have a set fix date. Discussion over the leaderboard issue is ongoing and once I have a fixed date to give you, I'll post it here. I will manually update the plunderboard graphic here on the boards in the latter half of the week. KeeperKatrina wrote: Fixing the plunderboard is not an insignificant effort, and will take some engineering work. It's on the top of the priority list, but does not currently have a set fix date. 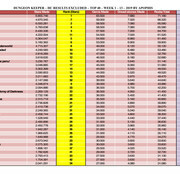 Discussion over the leaderboard issue is ongoing and once I have a fixed date to give you, I'll post it here. As I can see more players joined the void. So I would like to ask for updating this list please. As the bug isn't fix at the moment we would like to see how does our plunderer ran is going at the moment. Thanks.